Bonny Khalwale is the latest to declare his support for DP William Ruto’s 2022 Presidential bid. This follows an earlier announcement by Bungoma Senator Moses Wetangula, who declared his support for DP Ruto last week. “I have long experience in Kenya’s politics and I know it’s not possible to defeat a government candidate in an election,” Khalwale said. He refuted claims that he is shifting base for financial gain. “Please Church leaders I urge you to pray for leaders from my Luhya community who think I am in a commercial venture by doing what I am doing. 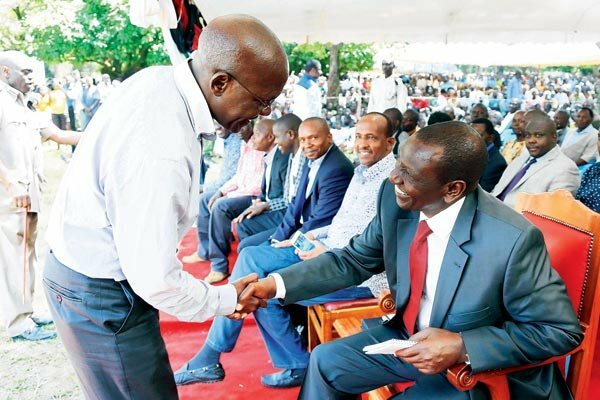 DP Ruto knows me and I know him well because we have been friends and we have also fought,” said Khalwale. This comes at a time when Khalwale, Wetangula and Amani National Congress (ANC) leader Musalia Mudavadi had hinted of bringing the Luhya Nation in one bought. Seemingly, the idea might not work. Instead, Khalwale has advised Mudavadi to be Ruto’s running mate in 2022. “When Mudavadi goes to get a running mate like Jeremiah Kioni and think he will make it then it’s a dream,” he said.